The merger boom could really explode. 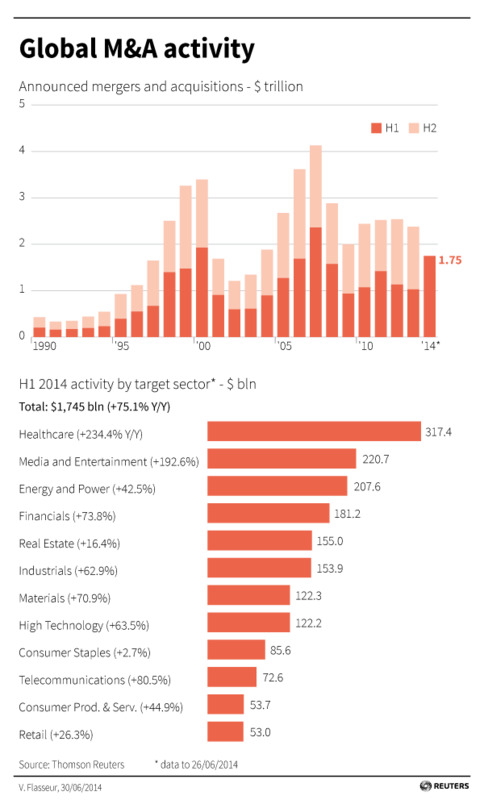 With about $1.8 trillion of M&A so far this year, 2014 is shaping up to be the biggest year since 2007. Looked at through the prism of history, though, it may only be the start. Standard measures of M&A activity can be misleading. For one thing, they tend to ignore inflation. A dollar – or several billion of them – used to buy far more. The value of assets fluctuates, meaning in some years companies are far cheaper than others. Globalisation also plays a big part these days. There were no merger surges in the USSR. One rough-and-ready way to reconcile it all is to set volume against stock market capitalisation. Over the last three decades, annual M&A has on average equated to 7.3 percent of Datastream’s total world market index, according to Breakingviews calculations. This ratio cycles from 4 percent to 5 percent at troughs like the one in 1992, to highs of 12 percent to 14 percent, as in 1999. With $3.1 trillion of deals over the last four quarters, according to Thomson Reuters data, and world markets worth about $55.4 trillion, the current ratio of M&A to market value is 5.6 percent. Suppose equities increase by another 10 percent by the end of next year to $60.9 trillion, and merger volume grows to its long-term proportional average. That would imply $4.5 trillion of acquisitions in 2015. It may be an overly optimistic figure, but there are plenty of reasons to think M&A momentum will keep rolling. Cheap debt, plentiful cash, investors rewarding acquirers, improving corporate confidence and economic recovery are all conspiring with the simple fact that deals usually beget more deals. What may be great for bankers, though, won’t necessarily benefit shareholders. The rush by U.S. buyers to find overseas targets merely to cut their tax bills, a trend that has contributed significantly to this year’s activity, could lead to many unhappy partnerships over the long run. What’s more, deal valuations are moving up, suggesting hubris is already setting in. So, yes, expect the surge in M&A to continue. And with so much activity so quickly, value destruction will rise along with it. Global mergers and acquisitions are being announced at the fastest pace since 2007, with about $1.8 trillion of deals unveiled in the year to June 30, according to preliminary data from Thomson Reuters. The volume represents a 73 percent increase from a year ago. In the busiest sectors – healthcare and media and entertainment, deal volume roughly tripled, to $317 billion and $221 billion, respectively. Goldman Sachs was the busiest adviser, working on $620 billion of deals.